This afternoon I got home and went right up into the paddock so that I could give Elf a vitamin B shot and (hopefully) her last antibiotic shot, and then I wanted to get her out with her babies while we still had some sunshine and daylight. I wanted her babes to have some time to get to know the other kids on the block and have some playtime. 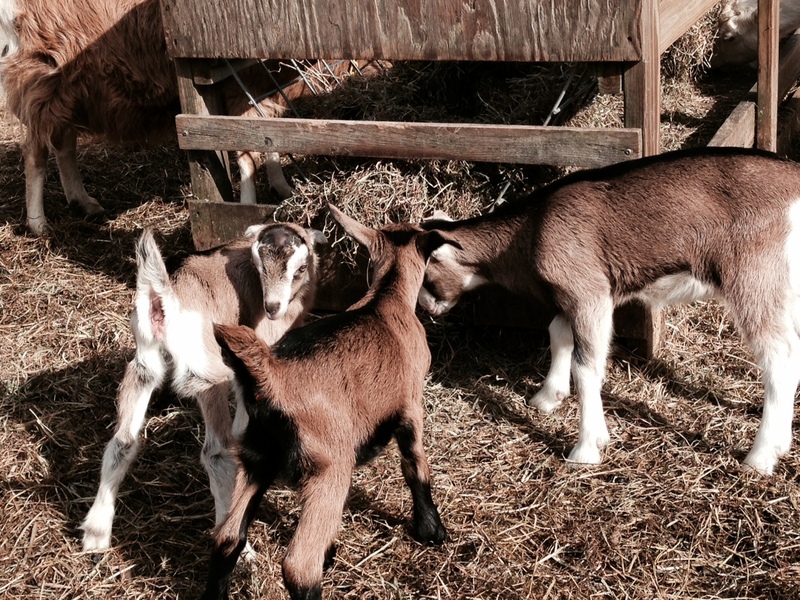 Well, the kids did fine and made immediate friends with Marigold and Iris. I always put out the feed for everyone in the paddock, so hopefully all the girls are eating when I spring the jugged mama and babies so that they are all busy. Sheep and goats will pick on each other when one has been away from the others for awhile, and the pecking order needs to be re-established as well. I have always known that although SnowPea and Elf have had issues, most of the time they politely ignore each other. This afternoon I was really taken aback by the fight that ensued up near the feeder when Elf came out to join the others. Elf gave SnowPea as good as she got, but became tired of the head-butting and walked away, again and again. But SnowPea would not stop her bullying. Wherever Elf went, SnowPea would rush over and bite at her and push her around pretty ferociously. So Elf couldn’t get to the feeder to eat her hay. I was very amazed at how long this went on, the better part of an hour. So I took some hay aside and fed Elfie out of my hand on the other side of the big rock while the babies cavorted and slid around us over and over. Every time SnowPea approached, I wouldn’t let her into our little private party. I think she got tired as well, and I began to be a little concerned because she was breathing so heavily herself. She finally gave up and went to lie down by the feeder and finish her supper. By the time I came back to the house, everyone was stationed at the feeder and quiet. Has peace broken out? It’s about time. I certainly hope they got it out of their systems. I worry about both of them, neither are spring chickens, and SnowPea is very pregnant, and has been the herd queen ever since her herd queen mama, Salsa, was out of the picture. I guess she takes her queendom very seriously! The baffling part of it all is that she never gave Zelda a sideways look when she came out of the pen with her babies two weeks ago. I don’t know, but it’s very interesting watching goatie society at work! Back to work today, vacation is officially over. It was also the day that needed a visit to the vet to get our newest little ones disbudded. 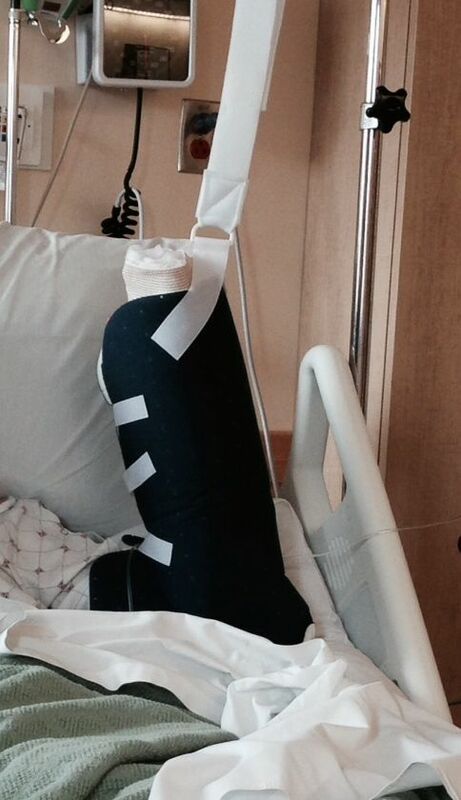 We were lucky to have her fit us in, and so we got that taken care of, thank goodness (the earlier the better!). Our little girl has a slightly different coloring than her mother, Elf, but she has that same lovely face and is a total sweetie. 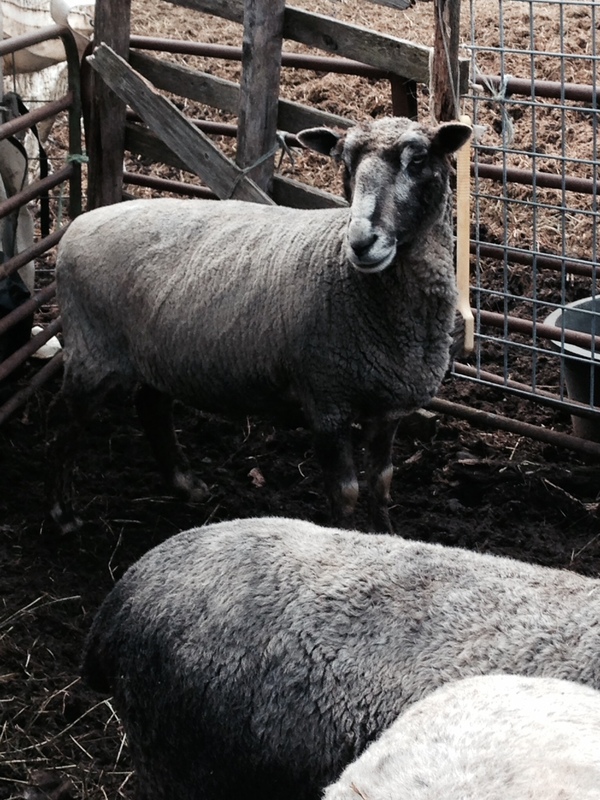 Her brother is the picture of Bagels the buck, but with floppy ears instead of stand-up ears. Beautiful boy! They feel like such peanuts compared to the older doelings who are on a tear around the paddock at any point in the day that they are fantastic entertainment. The two older girls are very fond of climbing all over me out on the big rock, and that is my fun every afternoon. Even though the weather hasn’t been that warm, we are still appreciative of the fact that it’s in the 40s every day, and not in the teens and the 20s! 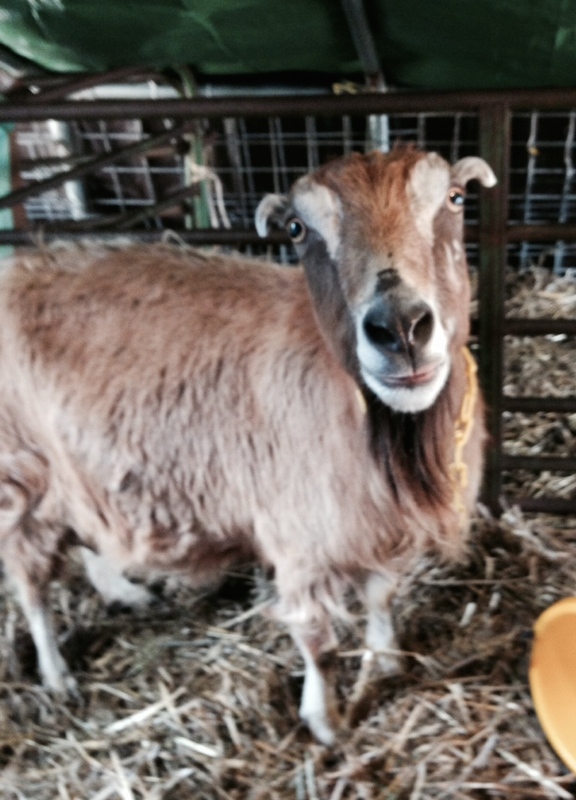 Tomorrow Elf will be wormed early in the morning and then hopefully everyone will be ok to be let out of their jug to join the rest of the goaties. Progress. Now all we need is for Pippi to have her kids. Not a clue when that will happen! Finally, Elf has had her big moment! I knew something was going on after chores yesterday as she kept walking away from the feeder and going into the greenhouse and just standing. So my hourly vigil began. 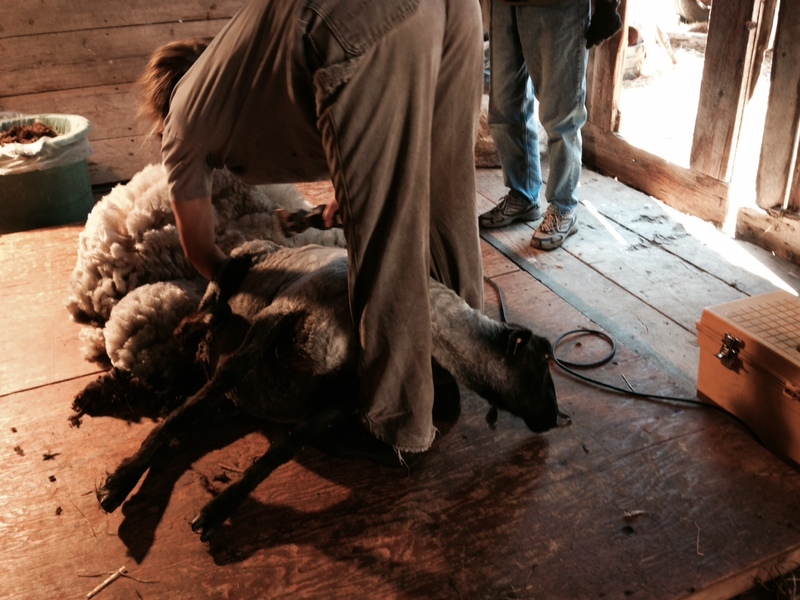 Put on boots, get chore gear on, walk up, check on goat, return to house, get chore gear off. I went out hourly until 1 a.m. and at that point she was bedded down with no signs of labor, so I went to bed. At 4:15 I woke out of a dead sleep and headed up to see what was happening. 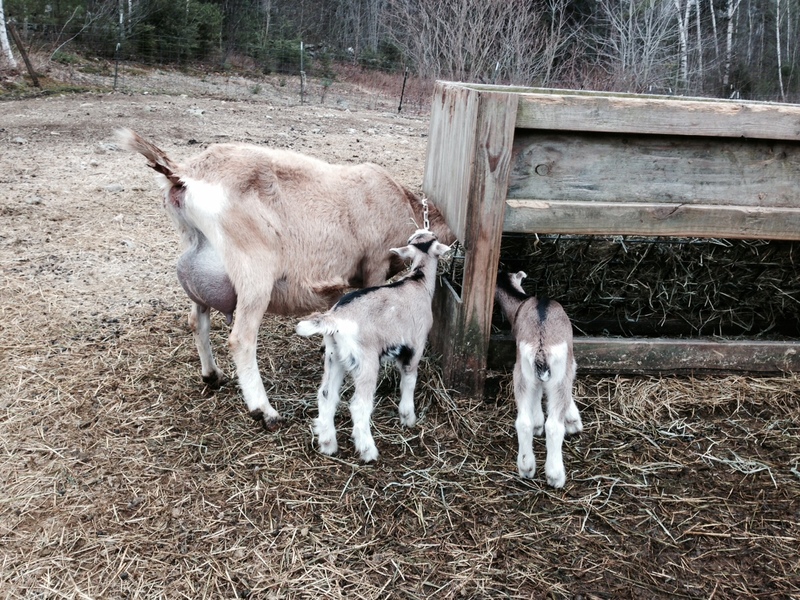 There were the babies, one dry and fed, the other one fed, not totally dry. Phew! Elf is a cagey one, she has always waited until our backs are turned, and then popped them out. She has never kidded at night before, however. She usually chooses midday and hides away while everyone else is napping out by the feeder. 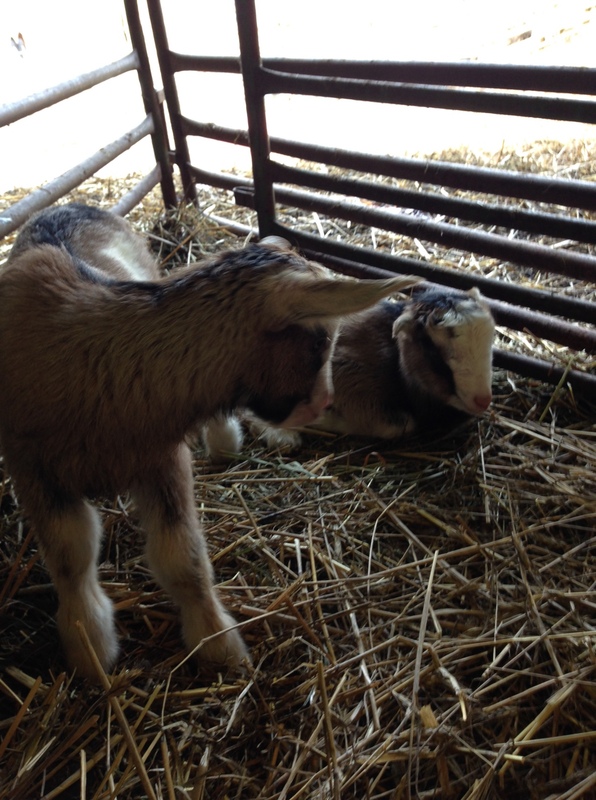 The smaller of the two is a doeling, and she was definitely the first out. The buckling has two pounds on her, and is dark like his daddy Bagels. Both are beautiful and strong, the doe with short ears and the buck with long ears. Even though it’s grey and damp out with some rain this afternoon, they seem to be faring well, and Elf as always, is a very attentive and protective mother. I kept trying to take photos of the little guys and she kept inserting herself between the camera and the little ones. It took some convincing to get her to move! And now it may be time to go and check on everyone again. 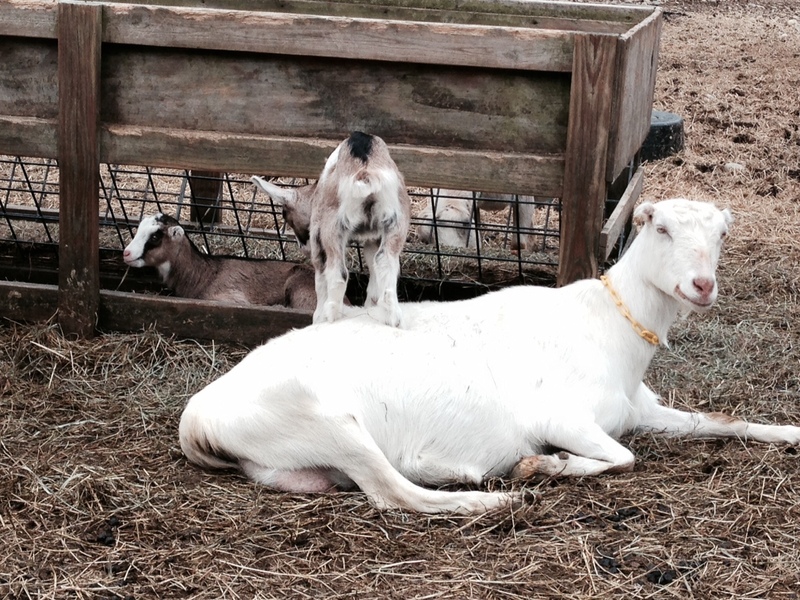 Pippi, the white doe with the long beard, is looking like she is dropped and is ready to go at any point. Maybe she will do us a favor and wait until the rain stops tomorrow in the morning, or nicer yet, have them this afternoon! That’s what we have today. It’s a crazy, wild one out there for sure. 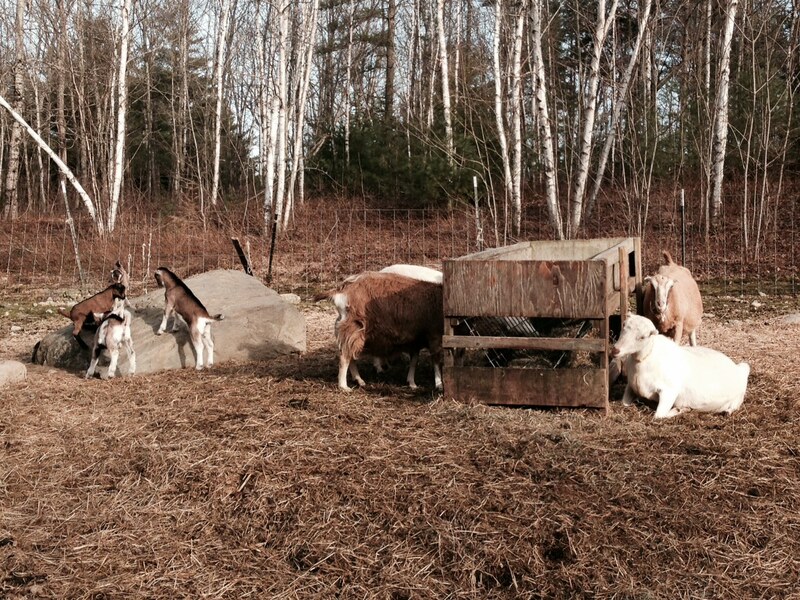 So far no new goat kids, but on a day like today that’s pretty much ok with me. 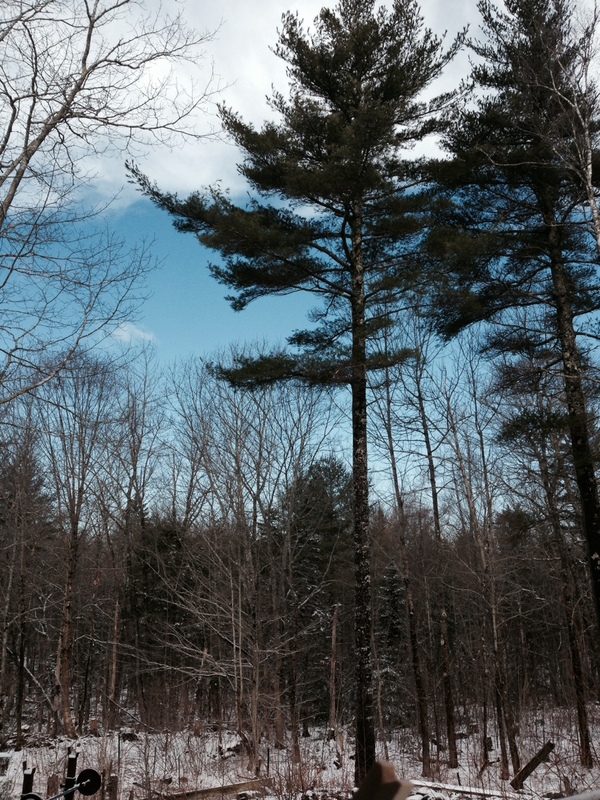 It’s not that cold temperature-wise, but the gusts could knock you down! We have had a fairly quiet few days. At afternoon chore time I am spending a lot of time out there messing around with the baby girls. They are so much fun. Marigold is the big-eared girl and Iris is the short-eared doe. They love to climb on me and nibble at my clothes. 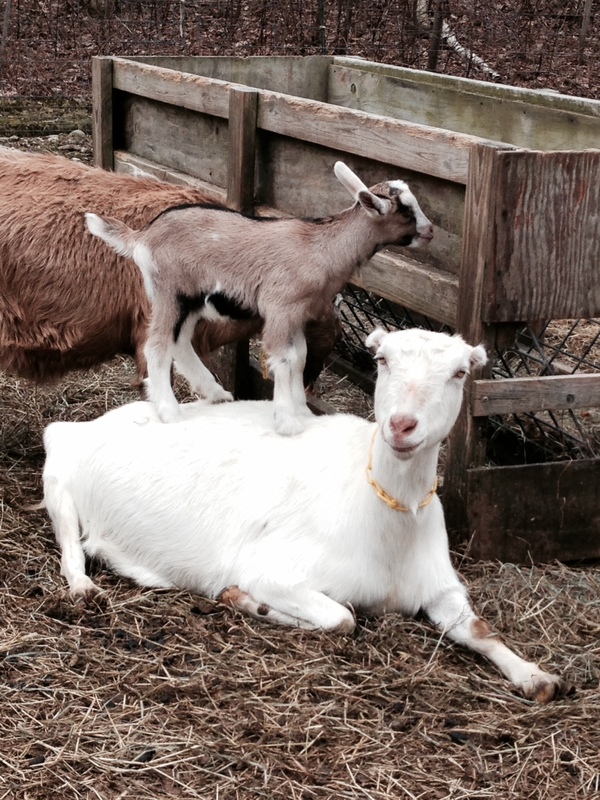 I am also putting their mama, Zelda, on the milkstand in the afternoons and milking her out a little bit. It’s not that I expect much, but when the time is right she will already be in the right place at the right time. I am also getting our old faithful SnowPea on the stand, even though she hasn’t had her kids yet. It gives me the chance to get her a little extra grain, and I am fervently hoping that she kids and has good milk for us again this year. She is a wonderful milker. 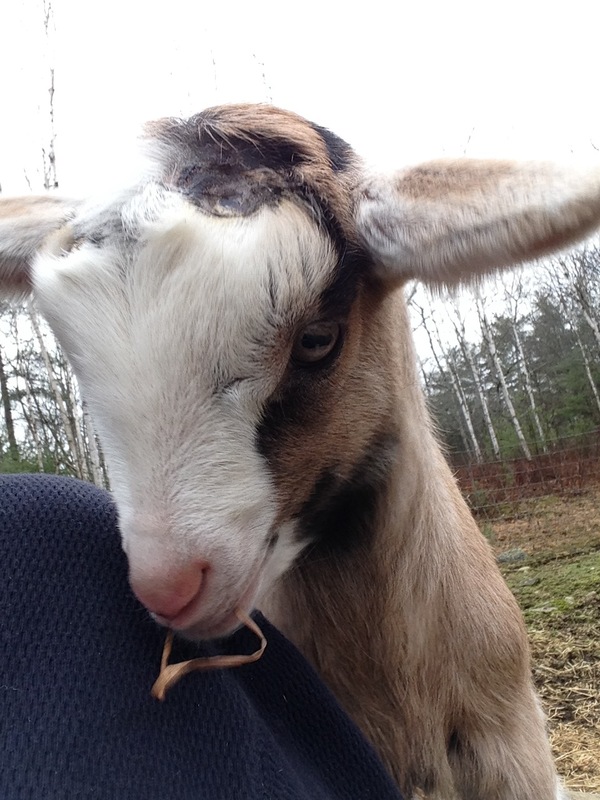 Here’s to thinking good thoughts about getting a doeling from her! 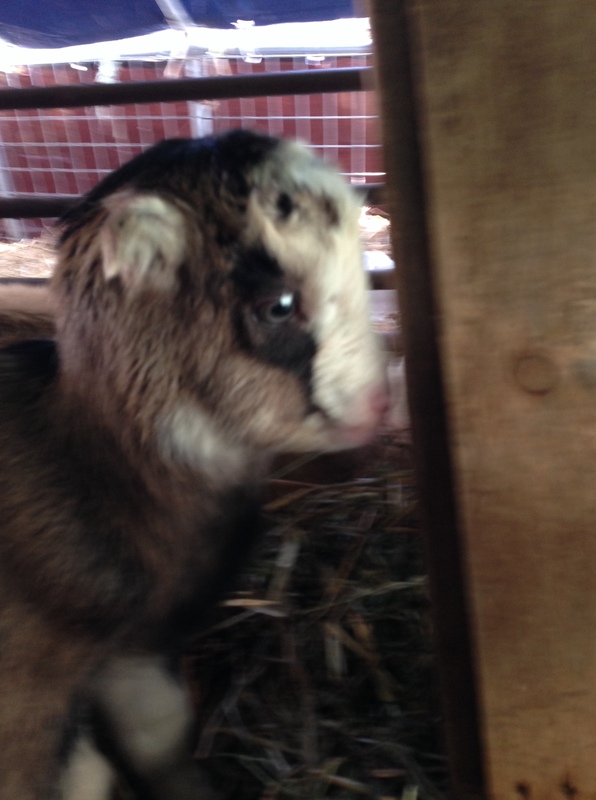 She also is about the most even-tempered of all the goatie girls and acts like everyone’s grammie out in the paddock. She doesn’t mind any or all of the babies using her like a trampoline. She just sits there as though nothing were going on, chewing her cud and having her afternoon rest. Tomorrow is Friday and the last day of April vacation. I knew it would be over too quickly! Next we have the amazingly fast run-up to the end of the schoolyear. I really can hardly believe it. And so this week has screamed by. Busy with taking care of John after surgery, the new doe kids, and watching for more births, I got through Friday in a rather exhausted state. We had a lovely visit from our grandson over night which was a lot of fun as always, and then yesterday and today turned out to be a fantastically beautiful day so we spent a lot of time outside working. Our beautiful doelings were set free on Friday morning before I went to work. It was time. I wormed their mama Zelda on Thursday morning, and then that afternoon I took the girls to the vet to have their hornbuds removed. When I got them home and reunited them with Zelda, she was definitely not happy with how they smelled (like burned hair)! But she was happy to see them, and they were not at all inconvenienced by the procedure, the vet gives them an anti-inflammatory before she does it. And so they have a little bit of a Mohawk, and they are dancing around on the big rock and experiencing the big world of the paddock. 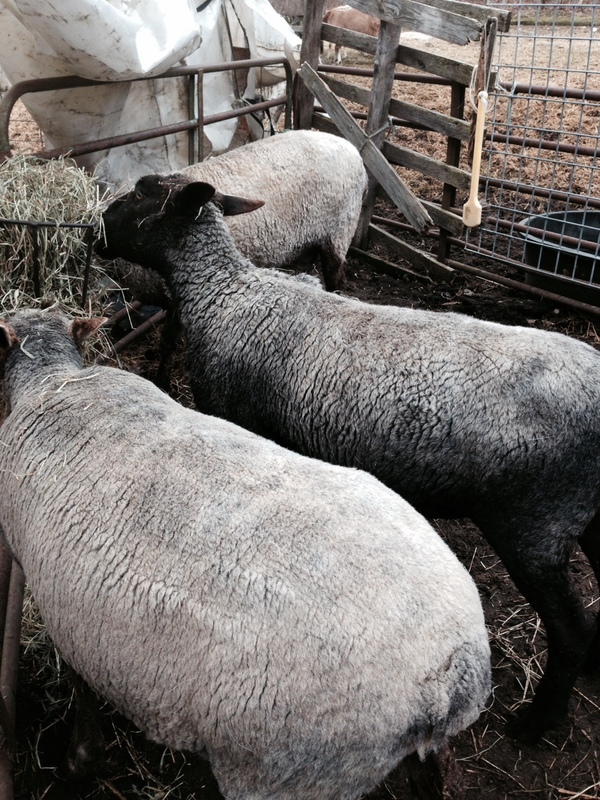 AND, they are already noshing on the hay at the feeder, along with mama. Always amazing! Yesterday afternoon I really thought that Elf was in labor, lying on the hillside in the sun, I really thought I saw a nose protruding. She kept getting up and licking her lips (usually happens when they are in labor) and then looking for another place to lie down. I ended up calling our friend Pam from Hatchtown Farm and we did a little closer inspection, but she definitely is not ready to kid. 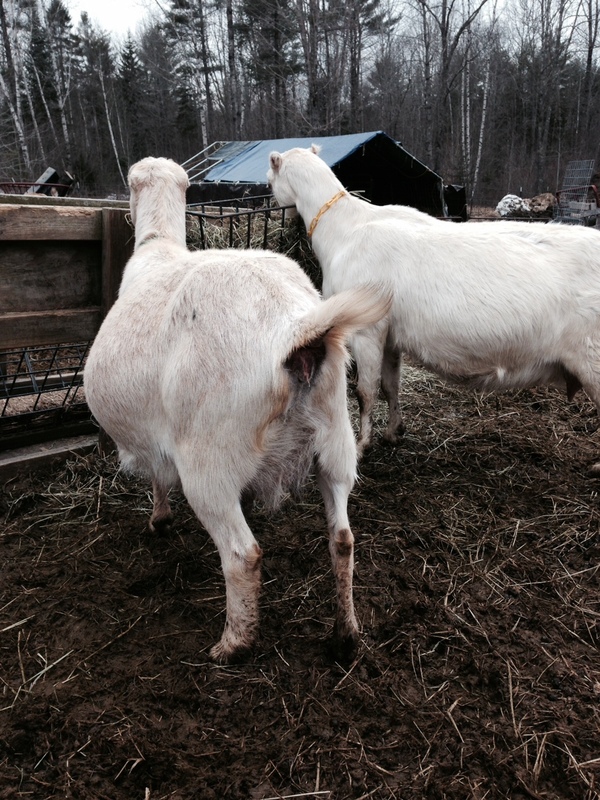 Being full of goat kid must be causing the bulge in the back end. All the goats but Zelda are looking uncomfortable now, but no one’s udder looks large enough to really be ready any minute. So we wait and appreciate the wonderful weather. Lots to do this week and I already am feeling like there isn’t enough time! 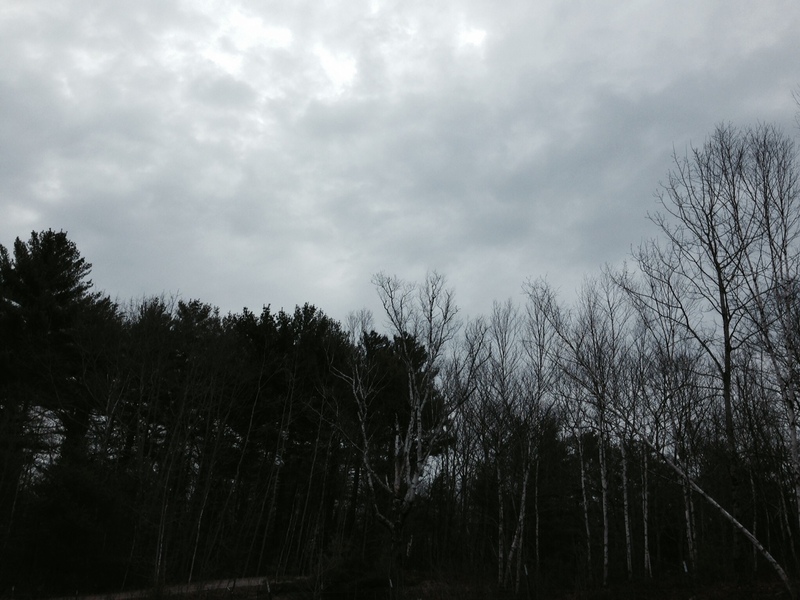 The rain and the wind came yesterday, and even the temperatures plummeted. 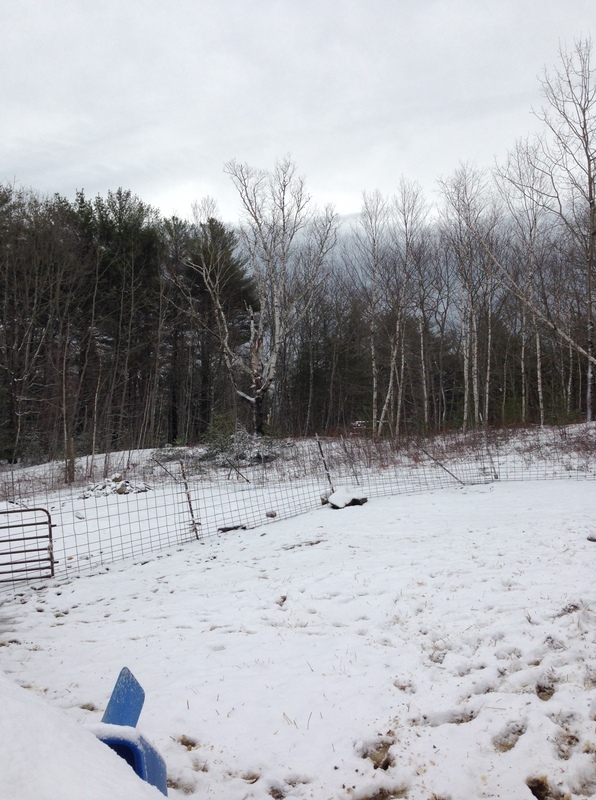 It was 22F first thing this morning and I had to scrape at least 2″ of snow out of the feed troughs. Rather rude of Mother Nature to throw that at us, but at least we are not getting hit as hard as the midwest is again. 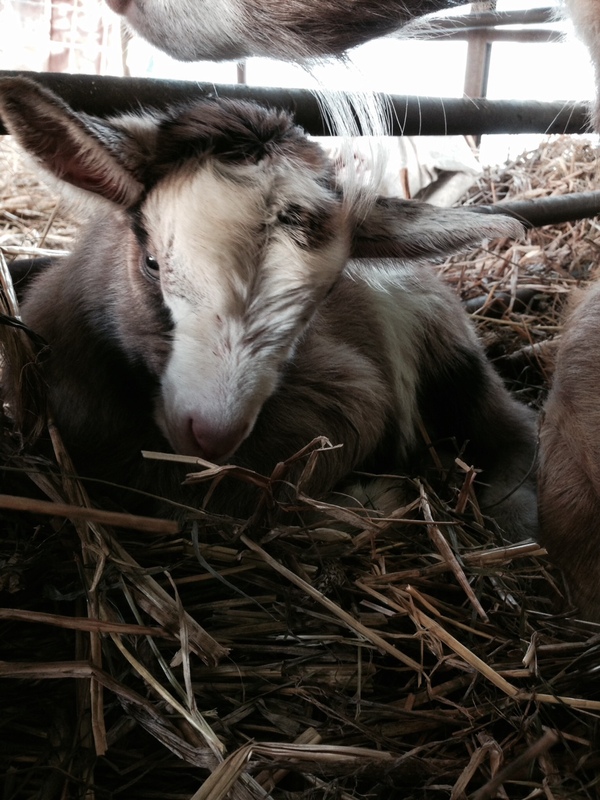 Our little goatie girls are doing well. They are going to be disbudded tomorrow afternoon at the vet’s. I actually am home today with a recuperating husband after he had some hand surgery yesterday for his advanced Dupuytron’s Contracture. Not fun, particularly since he is a leftie and it was quite bad in that hand. At the moment he is asleep in the recliner with his half-casted/bundled up arm elevated. (We had to throw a rope over the main beam in the living room, and attached it to the stationary bike! I better be careful not to move the bike!). Luckily, the day is improving. The sun is bright enough now that I can hear the snow crashing off the metal roof. I really have to get out there and take a better photo of our baby girls! But first, kitchen cleanup calls. Zelda held out until this afternoon sometime. I looped home before going on to errands (or I thought I was going to do errands) and I found Zelda in the greenhouse. 2 doelings with her, dry, fed and beautiful! I never did get out to do any more errands. 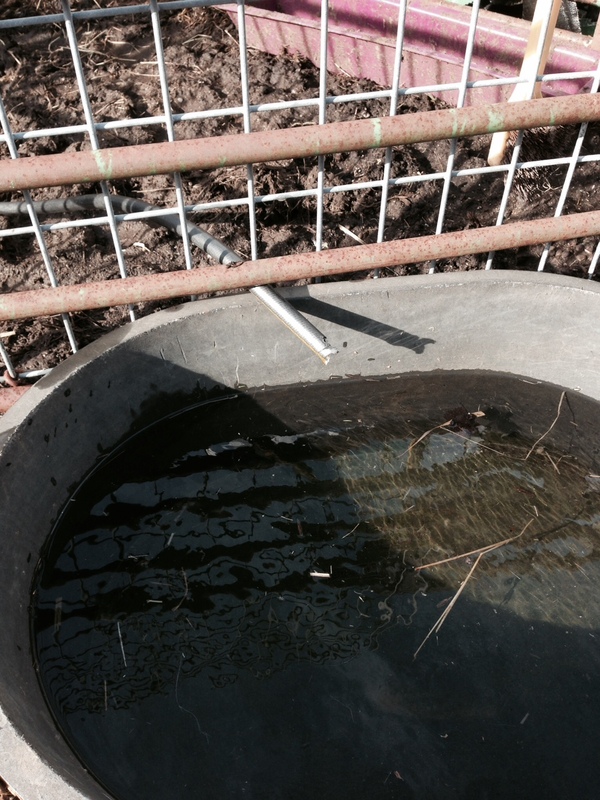 The second wonderful happening of the day is that we now have water coming from our dug well! Two reasons to celebrate tonight. I am hoping to get more sleep as well!